Vétiver Extraordinaire was released by Frederic Malle in 2002. The fragrance was created by nose Dominique Ropion, and includes bergamot, bigarade orange, pink pepper, nutmeg, floralozone (a "fresh air" note), Haitian vetyver, sandalwood, cedarwood, oak moss, myrrh, cashmeran, musketone and tonalide (synthetic musks). It is said to have one of the highest concentrations of vetiver of any fragrance on the market (25%). It starts with a brief flash of very dry citrus. It is quickly joined by the spice notes, and for a few minutes, it is extremely diffusive, which I assume is the floralozone talking. After that calms, it smells like damp mossy woods and vetiver, and there is almost no point in trying to dissect it further, as it simply smells like the sum of its parts, and if you love vetiver, it smells very wonderful indeed. Frederic Malle has said that it reminds him "of the forests in the north of France where his grandparents lived",1 and although I have never been in the forests of the north of France, I would imagine that that is as good a description as any. For a time there is a whisper of wood smoke over the vetiver, after that, it is just about linear, although the vetiver does get deeper and richer over time. If you do not like vetiver, it is hard to imagine that you will enjoy it, as Vétiver Extraordinaire highlights the natural qualities of vetiver rather than tempering them with sweet or bright notes. I don't find it too masculine to wear, but there is certainly nothing added to make it more feminine. Some time ago a dear friend gave me a lovely gift: the matching soap. It is simply wonderful. It has a very rich consistency, and the scent is extremely concentrated. One foil-wrapped bar perfumed my office for months before I could bring myself to use it in the shower. The soaps currently come in two other fragrances: Bigarade and Anterenea, and run $65 for 3 bars, or $70 for one of each fragrance. Vétiver Extraordinaire has excellent lasting power. 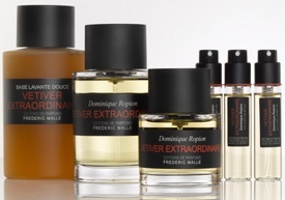 For purchasing information, see the listing for Frederic Malle under Perfume Houses. Other vetiver fragrances to consider: Guerlain Vetiver, Hermes Vetiver Tonka. 1. The quote was originally from Travel and Leisure magazine, but the link no longer works and I cannot find the original article on their website, sorry! Oh, I am very pleased you reviewed this one, because it is one of my favourite vetivers. Your review does it justice. Another vetiver I love is Vetiver by Lorenzo Villoreso, which incidentally I was planning to review today, but then decided to write on Rose d'Homme. Have you tried it? As a vetiver fan, I absolutely love this. Paradoxically, it makes me afraid to wear my little sample size bottle, for fear of running out. I just sniff it and spray it on my clothes once in a great while. It may be a full bottle purchase one of these days. I never thought of myself as of a vetiver fan, but I love Vetiver Oriental and Vetiver Tonka, so I guess I am a fan somewhat. What is your favorite vetiver scent, R? R, I don´t know Vetiver Extraordinaire yet, but I´d love to smell it. Recently I discovered my love for vetiver based fragrances, which I haven´t had paid any attention to before. Today I´m testing Hermès Vetiver Tonka – I got a sample *happy* – which I really like. Creed Original Vetiver is another vetiver which I like to wear – it reminds of sun & water, very summer-y. Is Vetiver Extraordinaire more masculine than the other scents (if you know them)? I don´t mind wearing fragrances that are unisex or even more on the masculine side, but I hate everything that reminds me of the smell of “Aftershave”. Perhaps you know what I mean??? V, It is about the only LV scent I have never tried, but I hear it is wonderful. Can't wait to see your review! That is the problem with the FM minis, of course, they don't last forever. I need a bigger bottle of this one too. It is a tie between the FM, the Vetiver Tonka, and Guerlain Vetiver. There is another by Carlo Corinto that is supposed to be wonderful and I hope to try it soon. Hi R! It is a nice vetiver fragrance and as you mentioned the great thing is that it is not aftershave like. I still have some I think (yes did not part with this one!! ;D) Must dig this up soon. My other fav vetiver besides Guerlain is also the one V mentioned – LV's creation. Hope you try that soon. Same here…I will never, ever catch up! N, so glad to discover something that you actually kept for yourself! !